View More In Binder Pockets. For organization of your loose papers, these two-pocket folders provide a classic, economical solution. Constructed of standard embossed paper, the folders are lightweight and flexible. Two interior pockets provide room for papers, brochures and booklets, and a business card holder lets you personalize the look of the folder. The rich coloring helps you locate them easily and makes for an eye-catching effect when presenting to clients, colleagues and more. Holds up to 20 sheets of paper. 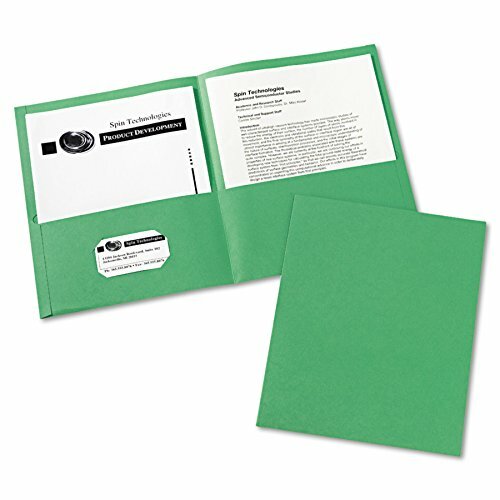 Front Cover Color(s): Green; Back Cover Color(s): Green; Sheet Size: 11 x 8 1/2; Capacity (text): 40 Sheets. Two-pocket textured-paper folders provide room for papers, brochures and booklets, making them ideal for presentation and general-office use. Rich coloring helps you locate them easily and makes for an eye-catching presentation. Includes business card slots on the inside front pocket. If you have any questions about this product by Avery, contact us by completing and submitting the form below. If you are looking for a specif part number, please include it with your message.